This two-reel short from Universal is an interesting twist on the many “lost girl” love triangles of the period. Some of its notability no doubt results from the fact that it was directed by star Cleo Madison, an early feminist who believed that women could do anything as well as men could, and that the day was not far off when everyone agreed to this. And men can do housework, too! Madison introduces her character, Eleanor, as “a tenement rose,” and we see her literally wearing rags as she hand-scrubs her laundry. 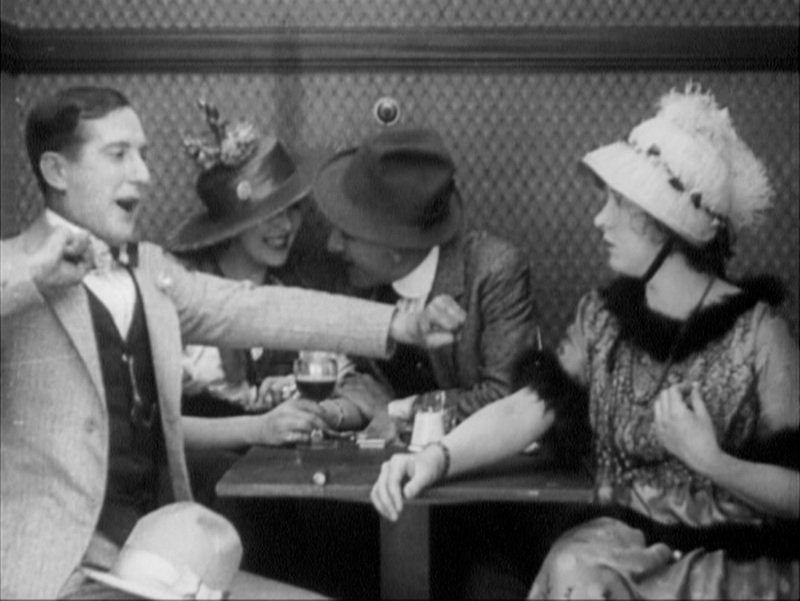 She also introduces William V. Mong, who wrote the screenplay and plays “Flash” Darcy or Dacy (the credits say “Darcy” but the Intertitles consistently spell it “Dacy”), a “shining light of the neighborhood.” Darcy comes out of a bar and runs into Eleanor’s mom (Lule Warrenton), who is carrying home a heavy basket of linens. He offers to carry them home for her and uses the opportunity to hit on Eleanor, who seems annoyed at first, but becomes interested when he flashes his wallet and agrees to pay for groceries and beer for the family. Mom rushes off to shop and leaves the two of them alone. Flash again ingratiates himself by offering to do some of the scrubbing and then invites a street musician to play accordion for them while they dance. 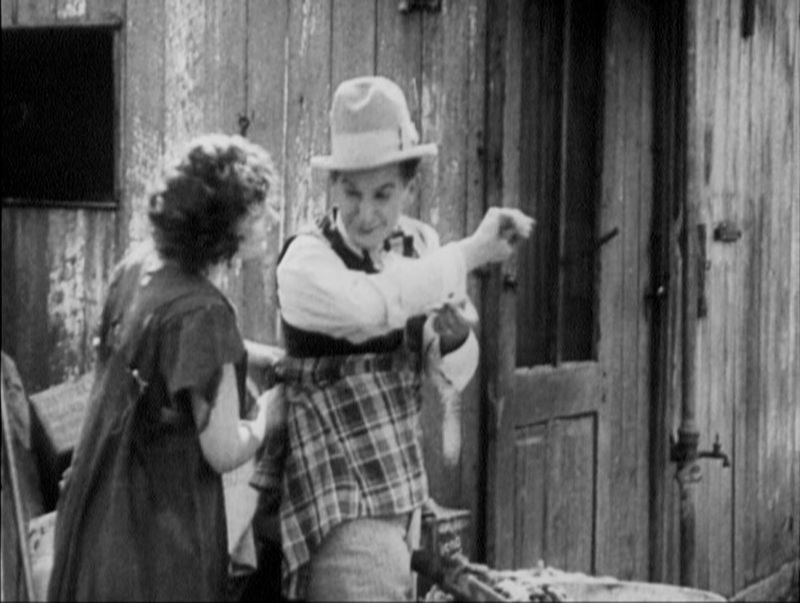 Now, Eleanor’s boyfriend “Red” (Edward Hearn, who’s called “Spike” in the credits for some reason) walks up, and he scowls at what he sees. Mom tries to make it better by inviting him in for beer and dinner, but he mostly sulks while Eleanor and Dacy chit chat. They arrange to meet while Red’s at night school that evening. At this point we cut to Eleanor’s less-pretty sister, who’s reduced to begging from men on the street. Then we see Eleanor’s reaction to the nice dress Dacy has sent over for her to wear when they go out (and a pair of socks for mother). He takes her on the town and shows her his trick of stealing a man’s tie clip by pretending to yawn and snatching it in his clenched fist. She’s impressed, but scared, and tells the man about hit, but it’s one of Flash’s cronies, who knew what was up the whole time. Now she tries, and fails, to get away with it. Some time passes, and we are given to understand that Dacy has been training her as a pickpocket. He brings a man with a nice tie clip over to her house and she does the fake yawn. But, instead of stealing the tie clip, she grabs Dacy’s gun from out of his pocket and holds him up, claiming to be an undercover cop. The man flees and a fight breaks out between Dacy and Eleanor, with the hard-up sister in the middle. Red’s been standing outside this whole time, and it finally dawns on him to come in and help and then mom shows up with a cop who hauls Dacy away, although I’m not sure on what charge. We are then told that “officer” Eleanor returns to her home life – which is pretty much like it was in the first reel, except now Red is a welcome guest. I did enjoy this little movie. In fact, I’d had a somewhat grueling afternoon pre-watching “Intolerance” and was ready for a nice light short. But, it had a few problems, plot-wise. First, I didn’t really buy Eleanor’s revelation that she was with the Secret Service. They sent her deep undercover so she could catch up with a small-time hoodlum that steals tie clips? Second, why does Flash need Eleanor in the first place? He seems like a good enough thief to steal all the tie clips he needs without her help. He certainly didn’t come out ahead on the deal: he had to buy all that food, booze, and clothing, and all he was going to get out of it was a tie clip? Finally, I do like the fact that Eleanor more or less rescues herself by grabbing the gun at the end, but then why did we need a big fight with Red and a policeman charging to the rescue? On top of that, I wish she had found some way to make Red more likeable. I was ready to like him when he showed up, since Dacy was an obvious skeeze, and he’s kind of a good-looking working class mug, but all he does is scowl and sulk until the end. Wikipedia makes the dubious claim that this is one of the first movies to include a twist ending, which obviously depends on your definition of that concept, but it isn’t really the most successful I’ve seen. Still, it was an interesting and fun little movie in its way. I liked the fact that Cleo makes Dacy do laundry, which fits with her idea that work shouldn’t be defined by gender, and she did look pretty comfortable with the gun in her hand, not like a typically nervous female of the time. I’ll keep an eye out for more of her work in the future. I have been unable to find this film for free online If you do, please comment.